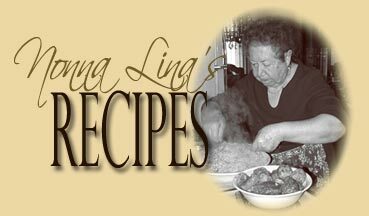 A collection of Nonna's own recipes for first course dishes, including pasta and pasta sauces, polenta, gnocchi, and various soup recipes. Secondi piatti, or main course dishes usually consist of meat or seafood. Nonna's collection of recipes includes everything from traditional baccala, to various meat dishes such as her healthy chicken meatballs, roasted chicken, roasted rabbit, and her own Italian style meatloaf to name just a few of the recipes she shares that she prepares in her own kitchen. Nonna's personal bread and pizza recipes can be found in this section. Nonna still makes her own bread every week, just as she has for years. Her country style bread is perfect for sandwiches, and to serve with all of her meals. Nonna always has a plate of homebaked treats ready when guests stop by her house. Here are all her family's favorite recipes, including many traditional holiday sweets she makes for her family each year. You will find side dishes for all your main course entrees here, including everything recipes for such family favorites as sauteed greens, and stuffed artichokes. All Content, Graphics & Design ~ Nonna Lina's Kitchen, 2002+.